A government minister has urged town centres across the country to look to Stockton for inspiration when bidding for cash from the new Future High Streets fund. Northern Powerhouse Minister Jake Berry MP visited Stockton High Street this week following the Government’s launch of the £675million fund on Boxing Day. He is the latest in a string of national figures to come and see the ongoing changes to the High Street at a time of unprecedented changes in retail. And his visit comes just a month after the council announced plans to step in and help town centres across the Borough. Mr Berry spoke to traders in Fountain Shopping Mall, where entrepreneurs are offered low cost space to test their retail ideas and met representatives of Stockton BID. He also met independent traders in town and learnt of the Council’s year-round events programme and ongoing work to restore the Globe. “It is amazing to see the redevelopment and investment that’s been led by the Council,” he said. “High streets are changing as more people shop online but we are determined to see high streets remain at the heart of the community. “I’m hoping that high streets up and down the country look at some of the ideas that we’ve seen in here in Stockton about incorporating events and creating spaces for entrepreneurs to go into. The Minister’s comments come as the council prepares its own bid to the fund to support a fightback across all of the Borough’s town centres. Council leader Bob Cook said: “We were delighted to welcome the Minister, especially as it’s only a few weeks since we agreed to step in and take control of key sites and assets in our town centres as and when such opportunities arise. “We believe in our town centres and are determined to support all of them – it’s not just about Stockton, it’s about Yarm, Thornaby, Billingham, Norton and Ingleby Barwick too. “We’ve approved borrowing of up to £30m to provide this support and it has put us in a really strong position to lever in additional money from the government’s Future High Streets fund because councils have to match any funding they receive from it. “We are of course, heartened by the Minister’s comments – they are another national endorsement of our long-term plan for town centres and for the progress we’re making but there is still a huge amount to do and we’re getting on with that. The government is urging towns and cities across the country to bid for a share of the £675m fund ‘to transform local high streets into modern vibrant community hubs’. Phase 1 applications are due in in March and the Government will assess them before announcing which have made it through to Phase 2 this the summer. 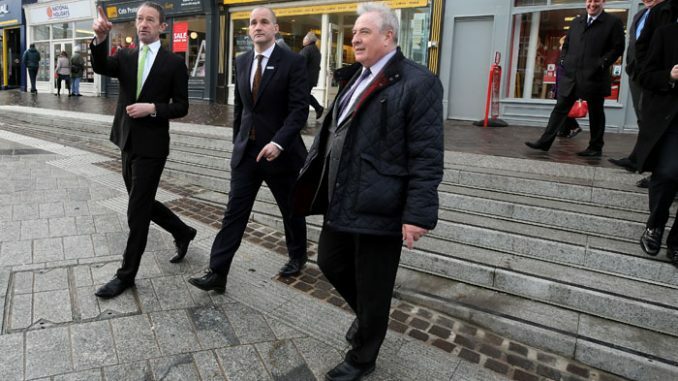 • Pictured above: Northern Powerhouse Minister Jake Berry MP (centre) is shown around Stockton High Street by the Council’s chief executive Neil Schneider (left) and leader, councillor Bob Cook.